This events page showcases events that are open to your attending. Stay tuned for more. Exclusive wedding packages up for grabs! For more information/registration, click here. Meet with Sheraton’s wedding consultants who will look after the finest details of your big day. Confirm your wedding with them during the Wedding Workshop to enjoy attractive additional privileges and exclusive promotional packages. For more information, please call +65 6839 5846 / 47 or email weddings.singapore@sheraton.com. Register online via SingaporeBrides. Join Holiday Inn’s Wedding Showcase and enjoy great benefits. DBS/POSB credit card members get to enjoy rebates of up to $3,088, free-flow of wine upon commencement of dinner and a 3D2N stay in Holiday Inn Phuket Mai Khao Beach Resort! Register here. Learn from DoWed on how to plan the biggest day of your life! Topics include managing your wedding timeline & checklist, budgeting for your wedding and exciting themes for wedding. Each couple will be entitled to exclusive discounts and lucky draws! Free admission is limited to first 100 couples only. Watch their previous seminar at Chijmes here. To register, email seminar@dowed.com.sg. Couples get to enjoy added privileges and a chance to win premium prizes if they book their banquets at the wedding show! For more information, simply contact 6845 1018 or email events.marina@meritushotels.com by 26 July 2013. BWOS is back with its 10th return. Featuring over 40 wedding merchants that include the largest selection of venues, leading hotels, bridal designers and more, it’s bound to make your wedding planning process more convenient and smooth sailing! There are also free marriage pep talks that you can attend during the fair. Register here for a free goodie bag! Traders Hotel Wedding Show features a bridal showcase by El Novia Bridal. Enjoy savings and perks when booking for your big day! Register via SingaporeBrides online here. Orchard Hotel features Master Danny Ruimin Cheong from Cheong Geomancy Consultants to help you select your auspicious wedding date at only $50 (U.P $160). Enjoy a sumptuous reception and check out the special perks! 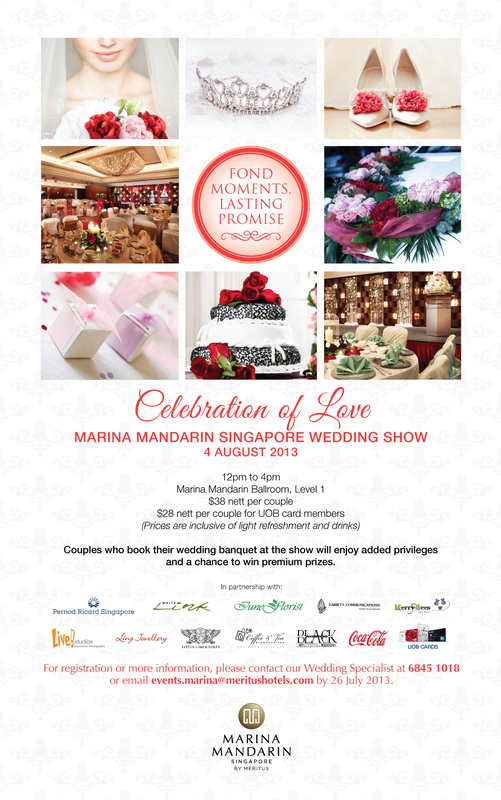 To register, call 6739 6582 or register via SingaporeBrides.